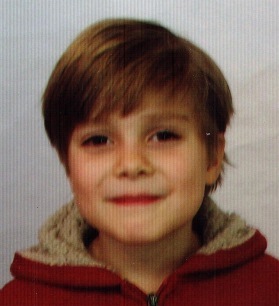 5 year old Cameron Serafin has been missing since Sunday, April 7, 2013 from Fairfax County, Virginia. Rebecca Serafin, the boys mother who shares joint custody with Cameron’s father, Joe Serafin, was supposed to return the child last Sunday and never did. According to police, Rebecca Serafin altered Cameron’s and her own appearance to try to avoid being found. Joe Serafin stated that he contacted his wife’s parents and they said that she had packed bags and told them she was going on a weekend trip. Rebecca Serafin’s car was found in Arlington, VA last Tuesday and there is surveillance video tape from a bank showing Rebecca withdrawing all her money and closing her account. This is not the first time that Rebecca Serafin has taken the child. Last year the mom took off with Cameron to California and it took the dad 9 months to find them. Police have issued a misdemeanor custodial interference arrest warrant for Rebecca Serafin; however, if she took the child across state lines, it now escalates the charges to a federal offense. Joe Serafin says his ex-wife, Rebecca, has a history of mental illness and substance abuse, which includes prescription drugs and heroin. The dad of missing 5-year-old Cameron Serafin believes ex-wife, son are headed west. The father of a missing 5-year-old boy tells WTOP he believes his ex- wife may be heading to the west coast with their son. Joe Serafin says he thinks Rebecca Serafin and Cameron may be heading west, but is not aware that she has any friends or family in that part of the country. Serafin says his ex-wife, Rebecca has a history of mental illness and substance abuse, which includes prescription drugs and heroin. For more updates, provide your opinions and analysis and read others, go to Scared Monkeys Missing Persons Forum: Cameron Serafin. If anyone has any information on missing Cameron Serafin or Rebecca Serafin, please contact the police by e-mail at http://www.fairfaxcrimesolvers.org , text “TIP187″ plus their message to CRIMES/274637 or call police at 703-691-2131. UPDATE I: Missing Va. 5-year-old, mom spotted in Las Vegas, Nevada. Authorities said a Virginia mother who disappeared with her 5-year-old son last week has been spotted in Las Vegas. Detectives think the child’s mother has changed her appearance and run off with the boy after he was not returned to his father on Sunday, April 7. Fairfax police said the pair were seen on Thursday, April 11, at McCarran International Airport in Las Vegas around 10 p.m. 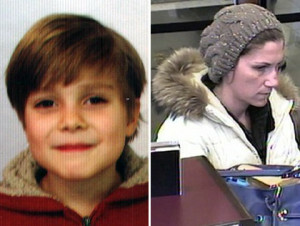 The mother and son had arrived on a flight from Birmingham and could be headed for Los Angeles, according to police.